Fibromyalgia Syndrome (FMS) patients experience widespread muscle pain and an overall feeling of fatigue. 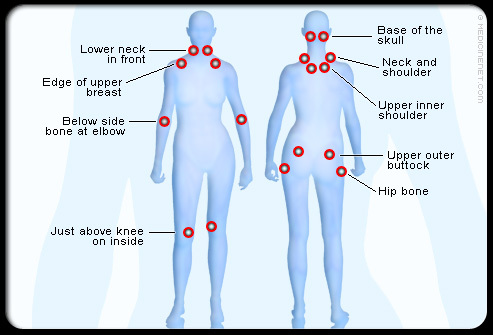 They are considered to have fibromyalgia (FM) if they have eleven out of eighteen “tender points.” Tender points are chronically sore and tender to light touch. Sleep disorders, headaches, anxiety and irritable bowel syndrome (IBS) are other symptoms of fibromyalgia. Patients also experience a “mental fog,” an inability to focus and pay attention. Fibromyalgia is more likely to affect women of childbearing age. The typical patient is 40-something with a history of insomnia. FMS can be triggered by high emotional stress, physical trauma or infection. People with rheumatoid arthritis and lupus are more likely to develop fibromyalgia. Doctors will conduct a physical exam and order blood tests to rule out other conditions. He or she will check for tender points and ask about your mental state and physical pain symptoms. If you have experienced widespread pain for more than three months you probably have FMS. Your doctor may prescribe medication, but there are also other approached that are very helpful. A healthy lifestyle is very important in managing FMS. Massage is particularly helpful in treating fibromyalgia. Massage relaxes the tense muscle tissue and improves the range of motion in your joints. Massage relieves stress and anxiety and helps you sleep better. Regular sessions are important to keep pain levels at bay. Hot stone massage feels good to those suffering from FMS. Heated stones soothe sore muscles and increase circulation. The infrared sauna at Woodstown Massage Boutique also soothes FMS symptoms. Pain is relieved and circulation is increased. Walking, swimming, yoga and tai chi have all been found to be helpful in controlling FMS symptoms. These exercises are gentle on the joints and increase blood flow and endorphin levels (feel-good chemicals). Regular exercise also reduces stress levels, another significant factor for FMS. Start out slowly with your exercise program. Initially it might cause some discomfort, but your body will adapt and overall you will feel better. Try to exercise at least three times a week. Pace yourself, don’t overdo it! Overwork worsens FMS symptoms. Rest when you aren’t feeling right. Know when to take a break. Eat a whole foods based diet with fresh vegetables and lean proteins. Reduce your sugar intake. Losing excess weight will reduce stress on joints and reduce pain levels. how we can help you with fibromyalgia, 856-769-1373. ← Chair Massage – Feel Better in Fifteen Minutes!